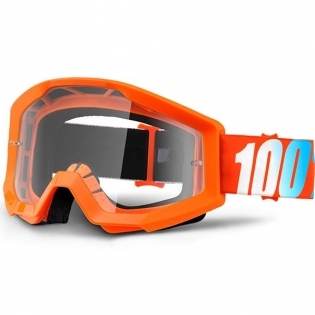 100% Strata motocross goggles are brought to you by 100% (Ride 100 Percent). Change your perception of what to expect from a budget goggle. With the Strata, we set out to redefine the standards for what an entry-level goggle should be. Experience elevated performance and comfort at an exceptional value. The Strata. Lead the charge. Purpose built for exceptional performance and comfort, The Strata arms you with high-end features at a value that enables you to put in those extra laps. 2 - Fitment: Curvature suited for comfort and great field of vision. 3 - Foam: Plush, Dual-Layered face foam soaks up sweat. 4 - Lens: Anti-fog, scratch resistant Lexan® lens for unimpaired vision complete with tear-off pins. 5 - Strap: 40mm silicon coated strap holds your goggles in place. 6 - Frame: Constructed out of flexible yet durable urethane featuring combined matte & gloss finish. Buy 100% Strata Motocross Goggles at Dirtbikexpress, the UK's favourite motocross store.